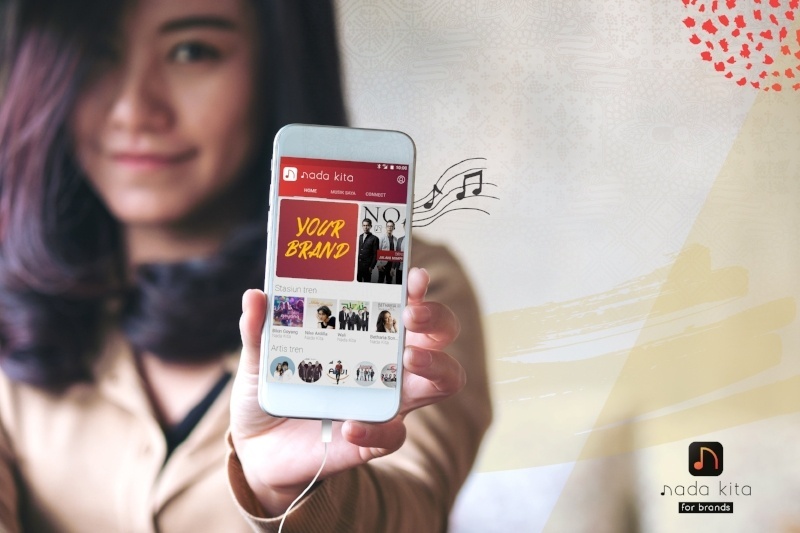 Tuned Global has created Brand Channels for its music streaming app, Nada Kita, to help Indonesian brands to integrate the #PowerOfMusic easily into their customer engagement strategy. 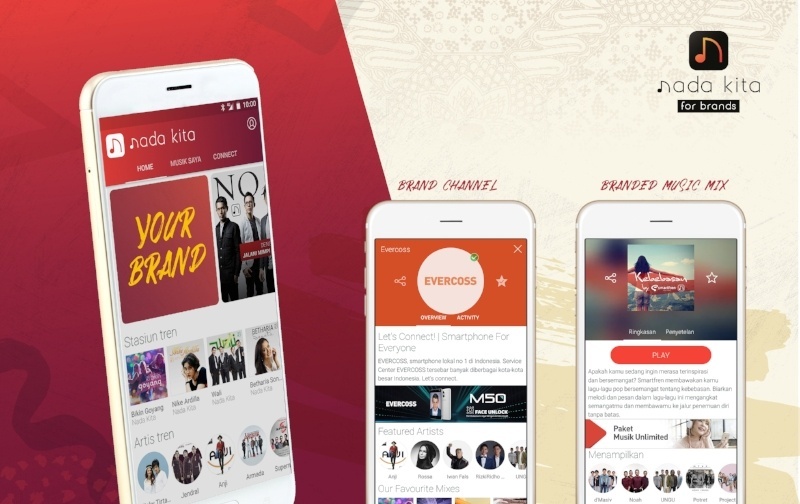 Nada Kita, a smart music streaming app exclusive to the Indonesian market, has announced today a new way for Indonesian brands to connect with audiences, called Brand Channels. This is integrated within the platform’s Nada Kita for Brands offering. As of December 2017 Nada Kita has been adopted by over 2 million young Indonesians, for who music is one of the top 3 activities on their mobile phones, according to a recent report from Jakpat. Nada Kita for Brands has already worked with different brands including SPC, Evercoss, Lazada and Smartfren. “We are very proud of what we have achieved in a little over a year without the budget of our multinational competitors” said, Con Raso, Managing Director of Tuned Global and co-owner of Nada Kita. The Nada Kita free music app is totally unique for Indonesia. It targets the mass casual music lovers, that traditionally have listened to local broadcast radio. They listen to local hits and “familiar” music everyday but they essentially look for recommendations and ready-to-go playlists. That is what Nada Kita offers them. “We have brought together the best of radio - easy - and the best of the digital - interactive and personalised” explains Graham Head, Head of User Experience for Nada Kita. People don’t have to think, they just play a music mix and Nada Kita personalises the experience on the go for them, thanks to its machine learning. The app is funded by brands, that want to take advantage of the music streaming boom and to speak the same music language as their Millennial customers. “Using music in your marketing strategy has always been complicated, costly and most of the time difficult to measure, that’s why we created Nada Kita Brand Channels” added Con Raso. It is like a dedicated minisite in the Nada Kita app, to allows brands to communicate deeper and directly with the music audience. Music can then be integrated easily into their global campaign. The Brand Channels complete the Nada Kita For Brands offer, which already includes Branded Music Mixes to capture a niche target audience according to a particular genre, mood or moment, and Audio Commercials to increase share of ear when people are multitasking on their smartphone. A recent Nielsen study that showed audio ads drive a 24% lift in ad recall compared to traditional display. Brand Channels, in the Nada Kita for Brands platform, now allows Indonesian marketers to integrate music into their content marketing strategy easily and at a reasonable price. They can actually promote their products to the audience that matters the most. They can measure the direct impact of their campaign, on the traffic driven, the engagement rate, or even conversion and sales. “This can be a game-changer for both brands and marketers and I believe this is the direction of mobile marketing.” concluded Con Raso. Nada Kita is a smart music streaming app in Indonesia, created by a leading mobile engagement company Tuned Global, in partnership with some of the Indonesia’s biggest music labels, including Aquarius Musikindo, Musica Studio’s, My Music, Nagaswara, Trinity and VMC. Nada Kita allows Indonesians to easily listen to their favourite local music for free without using a lot of data. No need to think, just pick a music mix or an artist and Nada Kita builds and personalise the playlist to your tastes. Join over 2,000 other music and brand marketing pros in subscribing to our #PowerOfMusic blog.